I want to be creative with these mocks. Offer something different. And with the Seahawks certain to move down from #21, I want to include trades. The Raiders trade Derek Carr before the draft to the Giants. And with a bevvy of picks, they make sure they get their replacement by jumping from #4 to #1. Murray is the most talented player in the draft. This is very early for Lock. However, reports suggest John Elway really likes him. And waiting until #10 could be dangerous. The 49ers will be motivated to trade down so it could make sense for both parties. Nick, just like brother Joey, falls to a lucky team owning the #3 pick. The Cardinals move down three spots and get one of the top defensive linemen. The Raiders move Carr to the Giants for their top pick. They then go and add a much needed edge rusher. The Jags sign a veteran QB (Joe Flacco? Nick Foles?) and then draft a replacement for Marcell Dareus. Green Bay trades with Buffalo to move up and get a fantastic scheme fit for their 3-4. San Fran swaps #2 for #10 and selects a cornerstone defender and leader. He’s a complete tight end and an X-factor in the passing game. The Bills drop three spots and start to build around their young quarterback. The Dolphins are starting their rebuild in the trenches. I think he’s a bit overrated and might last longer than people think. The Panthers wait for round two to get a safety. Of course the Browns will troll the Steelers by drafting Antonio’s cousin. Ford has superb feet and agility for his size. The Bills acquire a third rounder for trading down from #9 to #12. They give it to the Seahawks to draft Williams and convert him to center. His best fit at the next level is probably at guard. The Eagles love to draft for the lines and might need to replace Brandon Graham. He has everything physically but there are medical concerns and he drops too many passes. Jon Gruden had a look in his eye when talking to McLaurin at the Senior Bowl. They don’t have a ton of needs so can add a weapon here. They need more playmakers and Campbell is the real deal. They’ve been planning ahead at QB for a long time. After dealing Antonio Brown, the Steelers move up from #36 to secure a replacement. I think the Cardinals will look to trade down. If the Raiders trade Derek Carr before the draft they might want the insurance of guaranteeing his replacement at #1. The Giants want to win now and see the 27-year-old Carr as a better shot to do that than grooming a rookie. Clearly this is very early for Drew Lock. I wouldn’t make this move personally. Yet there’s reported strong interest from the Broncos in him. They could be aggressive and the Niners will definitely want to trade down. This is a deal that works for both parties. Allen is an ideal fit in the 3-4 scheme Green Bay uses. They jump ahead of the Niners (in the market for an EDGE rusher). The Bills move down a few spots and get the best left tackle in the draft. The Seahawks might not want to drop 19 spots. However, if a team actually wants to trade up badly enough it’s a way to pad out your draft board. In this mock draft the Bills acquire the 75th pick from Green Bay for trading down from #9 to #12. So they’re comfortable giving the Seahawks one of their two third round picks. The Bills also own two fourth round picks and two fifth round picks. So they have the stock to make a deal and not do too much damage to their own draft board. The Seahawks get a third, fourth and fifth for dropping 19 spots. The Bills move ahead of Baltimore to draft Alabama’s Jonah Williams to develop as a center or guard. This is only a first round projection but I have the Steelers trading up to #32 and need to explain why. I have the 49ers trading the #36 overall pick to Pittsburgh for Antonio Brown. With the Steelers having moved on from Antonio Brown they need a wide receiver. With several leaving the board at the end of day one, Pittsburgh moves up a few spots to get Samuel. I’ve deliberately not done a round two projection. I wanted to talk about options, not single out one player for the Seahawks. It’d be an interesting position to be in. It would illustrate Pete Carroll’s stance this off-season. They don’t have any glaring needs. They want to add competition. A lot of the players we’ve talked about during the draft process are off the board. There’s no T.J. Hockenson or Montez Sweat. Terry McLaurin and some of the other receivers are gone. Most of the top defensive linemen are off the board. They’d be left to let the board come to them. Who are the best players available? Where can they best add competition? And while I do think there’s a scenario where the Seahawks move down and still address arguably their biggest need (front seven on defense) — I can also envisage a situation like this where they’re having to go BPA. So what direction could they go in? I think the Seahawks like their safety’s more than the fans do and won’t feel that’s a position to target with their first pick. It’s not a good year at the position anyway, although you would expect Johnathan Abram and Taylor Rapp to be off the board reasonably quickly on day two. New Mexico State linebacker Terrill Hanks could be a possible option. It’ll depend a lot on his combine. How quick is he? How does he do in the agility tests? He earned rave reviews at the Senior Bowl for his ability in coverage and his speed. He’s well sized at 6-2 and 234lbs with 33 5/8 inch arms and a huge 80 1/2 inch wingspan. Hanks has longer arms than offensive tackles like Andre Dillard, Max Scharping, Kaleb McGary and Chuma Edoga. One of the things they loved about K.J. Wright was his length. Wright has nearly 35-inch arms and an 80-inch wingspan. They’re not going to take a linebacker in round two based purely on length. If Hanks has a great combine he could be on their radar. He’s already being compared to Darius Leonard — last years big riser after the Senior Bowl. It might be a lazy comparison based purely on position. Leonard was the #36 pick in 2018. We’ll see if Hanks gets into a similar range but some are starting to believe he will. There are intriguing O-line options remaining including Kaleb McGary, Greg Little and several others. The run on receivers at the end of round one has left that position a little dry and it’s the same for the tight ends. Drew Sample in this situation would be a better target later on (in a similar range to the Will Dissly pick a year ago). Renell Wren has the size, length and explosive athletic profile to provide some intrigue as an interior D-line option. There are still pass rushers available including D’Andre Walker, Brian Burns and Zach Allen. One player I’m really starting to like is Western Illinois defensive tackle Khalen Saunders. More on him in a moment. I’m not sure it’s that unrealistic that he could work his way into the second or third round. We really need the combine to shed some light. The Seahawks don’t draft average athletes with their first pick. Whoever it is will have strong positional traits. What is clear is they’ll almost certainly trade down. They’ll want to add some depth to the defensive front seven. I think they will identify a quarterback to draft. They’ll want competition in the secondary and they’ll likely look to add at the skill positions and possibly the offensive line. I think there’s a chance the likes of Will Grier (QB), L.J. Collier (DE), Jamal Peters (CB), Drew Sample (TE), Chuma Edoga (T) and Khalil Hodge (LB) could be possible targets after the first pick. I’ve been compiling a list of potential targets and why I think they might interest the Seahawks. I’ll publish it in an article soon and update it after the combine. I wanted to end by reflecting on two players I’ve been watching in the last 24 hours. Sometimes you watch a player for the first time and you instantly sit up and take notice. That’s what you get with Preston Williams. He’s an outstanding talent at receiver. He’s 6-4 and 210lbs and plays up to his size. However, he is so gifted at getting open. Give him a free release and it’s over. Even against top opponents like Florida — if you don’t get your hands on him you’ll get beat. If you get into him he competes and fights to get open. He competes for the ball in the air, makes improbable catches and can equally provide a downfield speed threat or the savviness to get open at the intermediate or short range level through sheer quickness. Reportedly there are serious character concerns with Williams and some teams won’t have him on their boards. It’ll be a real waste if he allows red flags to ruin his career. He has top-level potential and could be a major force in the NFL. Saunders was a star at the Senior Bowl and I wanted to see if I could find some Western Illinois games to see him in college. Saunders has the kind of ‘wow’ factor you want to see from small-school players. He flat out dominated at times. Saunders shows the power to physically bully linemen when engaged (sometimes simply tossing them to the ground) but he also has fantastic quickness to shoot gaps, swim away from blocks and burst into the backfield. He lacks length (6-0, 320lbs, 32 3/8 arms, 78 1/2 wingspan) but that probably helps in terms of leverage. I’m fascinated to see what he does at the combine (if invited). He’s an exciting player with the range to be a strong run defender and a pass rusher. This is a good hypothetical Rob. If this is what the Seahawks did…this won’t be popular, but IMO, you punt that 2nd round pick for several picks the following year (and a few later this year) and be ready to attack aggressively, including potentially targeting a QB. I’m just not sure I see anybody that does a whole lot for this team in the immediate future at that point. I’ve been on record saying that unless we are looking at a premiere DT, I would wait until Day 3 to address it. You can probably get a guy like Daniel Wise in R4 or 5, who can rush the passer. Why? Reed and Ford are really a dynamic duo. Any DT is going to have a limited role – so target a more one dimensional guy later. I’m preparing myself for a frustrating draft this year. The Seahawks made their bed with mortgaging the future and having limited picks. They are going to have to pay the piper at some point. Weirdly, the only position I see them pulling the trigger on with a higher pick is WR or TE. I could see this team loving Hockenson and Deebo Samuel and thinking they are a worthy addition that early. Very nice, well thought out mock. Hanks is a good look. A couple guys I think worth a shoutout for our first pick that might be available in this scenario Jerry Tillery (you want traits, this dude has traits) & possibly Mack Wilson. Haven’t seen any twitter rant from Tillery if that’s your concern, just a couple liked tweets suggesting his homies’s dad coaches take his coaches job (not a great look). Terry McLaurin going before AJ Brown, Samuel, Campbell will have you looking like a sage. You have been way ahead of the herd with him so far, great job there. Saunders at 45 is a little rich for my blood. I struggle with Tillery. On the field he’s inconsistent. Not sure on him. Just seems to be a lot going on there. A lot like Wren in that sense. Athletic, good measurables but inconsistent for sure. Like they say it’s what a player can do, not what they can’t. And both those guys flash some special stuff (I think Tillery even more so). McDowell could be put in that same group IMO. I think the difference between Tillery and Wren is this — you always notice Wren. Because he’s either playing out of control or he’s absolutely destroying the center. Tillery goes long stretches in a game where you barely notice him. Sometimes it’s a full game. But then he’ll make a play that stands out. Even so, several people have raised the issue about character flags with Tillery and I get it. I’m not sure I see a fit on this team. I only watched 3-4 games on each but didn’t really have any moments where I watched Tillery and went… meh, boring. I likley stumbeled upon a couple of his best performances. You have a game that stands out in a bad way that I can catch on YouTube to see what you mean? Tony Pauline like Wren a LOT. From what I have seen of Tillery, he is on the ground a lot. Possible liability against the run. For me if he falls to the 3rd or 4th round then maybe you take him because of his upside, otherwise I’m not a fan in the 1st or 2nd round. If McLaurin goes in round 1 it’s because he’s always been a 1st rounder and the SR bowl just affirmed it for scouts. Guys don’t get better between now and April. I think he’s probably a firm day two pick. That’s what I would suggest. I have him going in R1 because the Raiders have a need and Gruden seemed to absolutely love him. And at that point you’re looking at round two graded prospects in the late first anyway. So the Raiders might just take a guy they like. Doesn’t mean he’s always been a R1 though. And certainly I think the Senior Bowl opened eyes. Some players do really improve their stock in Mobile and I think McLaurin fits into that category. Improve their stock, sure. Get better, no. That’s the point though, isn’t it? He’s improved his stock. It doesn’t have to be a case of ‘he was always a R1 pick’. It could easily be — he convinced teams to take him one or two rounds earlier based on a terrific week in Mobile. Yeah I agree. I think a lot of times the guys that are “risers” are really just guys that the draft media are sleeping on. Most teams boards have very little movement I’d think, at least compared to draft media. Because the tape doesn’t lie. Guys don’t get better but in McLaurin’s case he took advantage of the opportunity to showcase his skills at the senior bowl and improved his stock big time. Same player but different perception. What makes you a first rounder? Getting drafted in the first round. You’re just arguing semantics. Tony said a few months ago that he had second day talent but had serious character flags that need to be investigated. He didn’t say he was going to go in round three. This is the type of receiver that will round out the talents needed for the Hawk’s receiving core. His professionalism will flourish as he matures and is placed in a structured environment, such as the WR Group led by ADB. He’s still 21yrs old. No, he may not have made such a concerted effort to restore his image, as did Simmons. Nor was his incident to vividly portrayed so that all could see, as with Simmons. Has he put behind him his past indiscretions? That is something JS will ascertain. From what is seen on his twitter shows his head is set on doing so. “A Mind is a Terrible Thing to Waste”, so is Talent. The point is though, Tony isn’t saying he’ll go in round three. He’s saying he’s a third round grade. Which is extremely fair. We can’t compare to Jeffery Simmons at all in this situation. Simmons had a very public isolated incident that was all over the media before he started college. He’s since spent three years working extremely hard to repair his image. And all the noises recently are that he has done that. For example, Zierlein has him as a top-10 pick. The noise around Williams is the complete opposite in this instance. There appears to be a track record of issues. He’s also been kicked off a team while Mississippi State have done nothing but promote Simmons’ character for the last three years. All I’d say is, don’t get your hopes remotely up about Williams. Not even just about the Seahawks, about a pro-career. It sounds like he’s going to have a job on getting drafted. Much in the same way Da’Rick Rogers did. And as much as I really liked what I saw on tape, there are players like this every year. All the talent and it goes to waste. I’ll be as happy as anyone if he does some stellar work convincing teams in the coming weeks. But Zierlein’s tweets indicate this is pretty unlikely to happen. There was a lot of noise from Zierlein and others surrounding Frank Clark, as well. His incident occurred more recently, towards the draft, while in college. Yet, due diligence was wrought upon Clarks true character. In the end, it worked out well for both parties. Like Frank, some people have been brought up in difficult surroundings in life. It may just take the right person, or circumstances, to set one on the right path. Bruce Irving with Pete Carroll is another example. I would not underestimate the value of a Coach like Pete Carroll, and the support network of personal people like Maurice “MO” Kelly that gives the support structure that is needed to strive as a professional, if given a chance. That’s all this young man needs, is a chance. Isn’t that what PC & JS are looking for, those with a chip on their shoulders, wanting to prove those neigh sayers wrong. So I would say, let them keep blowing smoke. Keep giving Mr. Williams fuel, to light a fire that will light up the league. Whoever gives this young that opportunity, will not regret it. Hopefully, it’s in the VMAC that he sharpens his wares. Preston Williams looks to have the talent similar to Bengals WR AJ Green, whom was a top-5 pick. The Chiefs WR Tyreek Hill fell to the 5th round because he hit and choked his pregnant girlfriend. So IMO its a balance is the player an elite talent like HIll, or our own Frank Clark AND after interviewing the coaches and his teammates does the player truly seemed like he has truly changed for the better. So for me, I would probably take him in round 3 or 4. HIs highlights look so much more impressive than any WR in this draft. Also, I think a mature Doug Baldwin could be a great mentor for on the field and off the field life for Williams. Agreed. Even Zierlein mentioned he’s the most talented receiver in this draft. The question is who has the guts to take a chance on him. Unfortunately, I think that’s going to be GB. The just hired Preston Williams WR coach from Colorado St. yesterday, which presents an ideal landing spot to begin his professional career. You may have to go to the 2nd or 3rd Rd to get ahead of GB. GB made a Great Hire. I guess “guts” may not be the best way to describe the necessary factor when making a decision on drafting Preston. What I was enfuring had to do with handling the media, and public fallback that would result when making that selection, after a diligent investigation of Preston’s past infractions. It would take a willingness and fortitude to stand by their decision in face of public scrutiny by those who oppose such a decision. There were some people in the media, and the public alike, still think Frank Clark should not be allowed to play, until recently when he’s taken leadership role. Clark gradually mature. That’s what appreciate about Pete & JS. They saw the positives of a person, and it was enough for them to stand by Clark, and their decision regardless of the flack that would incur. Some of those decisions don’t go so well, as with McDowell’s unfortunate accident. The willingness and fortitude is what I was alluding to. I’m sorry if you have taken my comparisons a different way. But, the only serious incident that I’ve been able to see occurred 3yrs ago during his year of ineligibility. I’m I missing something that you mentioned resulting in him being kicked off his team? Other players did UTenn, not Williams. In the end, one should NEVER lay his hand on a woman Forcefully. As a teenager, all have made mistakes in life. But, one should not be labeled for rest of his or her life because of it. PC & JS are one of many that understand that, and are willing to give them that needed 2nd Chance. It worked quite well for Coach Bobo. I’m sure GB will also reap such benefits. If JS does not slide in ahead of them. We shall see! I thought of AJ Green as well. There was no such noise about Frank Clark. That’s not true. Some people debated whether Frank should’ve been invited to the combine then people like JLC kept saying he would go in R2 (he did). You’re coming up with some pretty awful comparisons to Preston Williams. From all the talk…. All Im hearing is Malik McDowell Rob. And I am not here for that again. Havent had a chance to hear his interview voice but with Malik you could absolutely FEEL that he was no pro. It was palpable McDowells lack of spark and determination to make the NFL his life. Put me down as a yes for Preston Williams! Wow! P.S. Typo: I don’t think Saunders was at the Shrine Game. Just Senior Bowl. Thoughts? Pretty light on D, I realize. Prob too much, tbh. But they address their biggest needs on D: DL, LB, CB. Probably no way in hell that Benny Snell is available in the fifth. Make more adjustments if needed, but keep the mocks coming!! Really like the direction of the mock though. Nauta definitely needs more attention. I’ll take a quick shot at a mock here. R2P40-QB-Will Grier – RW insurance, like it or not, it’s preparation for the future + fills QB B/U need. 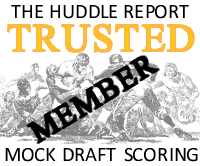 R3P74-DE/EDGE-Charles Omenihu -or- DE/EDGE-Austin Bryant – I’d slightly prefer Omenihu. R3P84-DT-Khalan Saunders -or- DT-Greg Gaines – Prefer Saunders, pretty close, so either would do. R4P105-ILB-Kahlil Hodge -or OLB-Justin Hollins – Either one would do at a position of need. R4P117-CB-Jamal Peters -or- EDGE/LB-Jordan Brailford, Peters preferred, Brailford -IF- EDGE is still needed. R5P136-TE-Drew Sample -or- TE-Trevon Wesco – Sample greatly preferred. R5P148-WR-Jalen Hurd -or- WR-Terry Goodwin. either work but I like the big upside of Hurd & his size/speed. UDFA’s: DB, OLB, OL, DL, RB, WR + a decent PK. I would be happy with this draft and think most picks MAY be approximately within the range of the Seahawk picks, subject to some changes after the combine workouts. Perhaps #148 gets traded down as well for even more later round picks? nice mock, but I personally couldn’t draft a QB in the 2nd round, when I already have a legit talented & healthy QB. Have you been reading Rob’s latest articles…? *Considered going R2 DT Tillery/Wren pushing LB (Tranquill) to round 3 and corner (Peters) to round 4. 7, Isn’t Deiter is better than 5th round? Deiter likley is better than R5. Senior bowl couldn’t have helped him from what I saw. But Pauline has him as R5-6 so I figured I’d throw him in. I remember a couple years ago many here thought Connor McGovern from Missouri wouldn’t make it past R2-3, some people were mocking him as our first pick pick. Then he lasted until R5, so you never know. Cool, I would love this spread. Adding potential day 1 starters, some depth guys, some guys who could compete. I think everyone sees the front7 as an important piece, and we talk about TE depth and WR3 too. But I think OG depth and what happens after 2-3 years from now could be important too (a guy with potential might need 2-3 years as backup to develop as a future starter). And I think we really need a CB who can push Griffin and Flowers to perform even better. His stock has fallen a bit, and the Senior Bowl didn’t help either. But he is a gamer. I know, Rob has him as a continuous first rounder. I think the teams being into the S market are no good fits for Rapp, they will prefer jumparounds like Jaquan Johnson or Gardner-Johnson, so he may slide and is to good for Seattle to pass. Fallen from grace for many commentors, but boy did he produce in 2018. He gets shunned for his fumble vs OU, a game that he dominated. Very good fit for Seattle, and good gut feeling. Had a bad Senior bowl, that opened the discussion about his footwork. He will fall, some say to R5. Happy to catch up a R2 prospect here. I don’t think, Cajuste or McGary fall that far, but if they did, I would take one of them instead. If all fails, Connor McGovern, G, Penn St, who is a decent run blocker. Two seasons around 1,000 yds, prototype slot target, decent intermediate routes and faster there than a TE, good hands. Completely under the radar, so hopefully a late-round gem. If not, Isabella, Renfrow, Jennings… a lot of opportunites. One year wonder, but showing no nerves and has a leg as good as you can get one. A little early here. I would trade the entire draft for Christian Wilkins and call the day. I don’t want to see another draft trading down for less talent and miss out on Juju Smith-Schuster. It’s a real shame they took all these players on day three and missed out on…. Ju Ju Smith Schuster. I just find it hard to have an interest in day one of the draft when I know the Seahawks will trade out of round one. I just check in on the internet once in awhile to see what the other teams picked up and if there were any swaps. Yep, Just the normal day in the life of the trade down Hawks. At least it shouldn’t be surprising anyone at this point . . . They havn’t hit every year with those type of players in the early rounds, and when they did make 2nd round picks (paul richardson & christine Michael) they were kinda disappointments. Rob- Lance Zuerline proposed an interesting hypothetical yesterday… could Oliver be a modern-day Teddy Bruschi/Levon Kirkland; a big MLB (and maybe play on the line on occasion)? Do you think that is possible, or has the modern NFL evolved beyond that being a possibility? It’s not something I personally ever considered. I respect Lance enough to take interest in that suggestion and give it more thought. I think this sums up the issue with Ed Oliver though, the problem we’ve talked about since the summer. What is his fit in the NFL? What is he? Because if we’re now even wondering whether to try and convert him to linebacker, that pretty much says it all. I think its going to come down to the brains of the coach that takes him… Get someone like Pete who is a master at utilizing strengths, he could easily excel. Get someone who doesn’t/can’t think outside the box… could be an epic bust. Burns. Put him at LB (SAM/OTTO) and let him rush from wide angles. Not many that have the juice like he does to get after it. Yes, he weighs who knows how much. Give me a guy at LB who can rush the passer over one who can’t if it ain’t a MLB. Has N’Keal Harry always been built like a super hero? Clangin’ and bangin’ brother. Interesting that some teams have Ed Oliver as a LB. Including one at MLB according to Lance Zeirlein. I just find it really hard to get excited about the idea of Burns as a specialist rush linebacker who you take off the field for a high percentage of snaps. Plus I’m not sure you can trust him to do a lot of the linebacker stuff he’d need to do to enhance his role. He’s a very good college pass rusher. I just feel like we’ve seen these types before. Montez Sweat might be 20-25lbs heavier than him and we wonder about Sweat at the next level. He needs to be in the 240’s at the combine to allay some fears and then have a great workout. For me Burns is similar to our own Barkevious Mingo, skinny college pass rusher who needs to transition to LB. Burns may be best going to a team that runs a 3-4 defense, so Burns can try to fit in as an OLB pass rusher. Burns is a much better and more refined pass rusher than Mingo every was in college and has more length. V12 you may be right about putting Burns at OLB and letting him get after the QB, but I don’t think he would be asked to do that much in our defensive scheme. We had Mingo and Shaquem Griffin whom were good pass rushers in college, yet we played them off the ball in our scheme. I would have loved to see Shaquem be let loose to blitz the QB, but our coaching staff seem to prefer the front four to get after the QB. I’m right there with you in would have loved to see Shaquem blitz and get after the QB, but it seems that’s not what our D-coaching staff is comfortable with. So for me its about drafting players that fit our scheme and Burns would be a waste in our scheme/coaching staff. Rob, do you believe it’s impossible that McLaurin could fall to the 2nd round? It would be very heartbreaking that the Seahawks couldn’t get a shot at him in the 2nd round anymore. Not at all. It’s very possible he drops into round two. I just wanted to represent in this mock the possibility Oakland fell in love with him. Thanks for all the content you are putting out! I’m amazed that almost every day I check in it seems like you’ve got a new article put up. Now that we are getting fully into draft season I was wondering if there are other sites that you or anyone else on SDB recommend for draft analysis and/or sources of different players to check out. Thanks! Agreed, how great is it to be able to review all this great content and the related feedback from our 12 community? Rob must type like 200wpm. He essentially completes one college dissertation every couple hours. The man is a machine. Yeah . . . This would be good. A small trade down in the first, and again in the third. Round 1. DT Dexter Lawrence, Clemson. Long, strong, agile. Instant starter. Round 3. OG Chris Lindstrom, BC. Polished technician with tenacity. Round 3. WR Deebo Samuel, South Carolina. Turn small plays into big gains. Great compliment to Lockett and Doug. Round 4. EDGE Jalen Jelks, Oregon. Production doesnt match the raw talent. Length to spare. Needs to learn to bend the edge. Dominant in senior bowl practices. ROUND 4. CB Jamal Peter’s, Mississippi St. Long, physical corner with a chip in his game. Round 5. LB Terrill Hanks, NM state. Small school kid with big time range at linebacker. Round 7. WR Preston William’s, Colorado St. Long, lean with field speed. Down field threat. Former SEC recruit who transferred to Co. Round 7. QB Jake Browning UW. Why not? Mo way Wilkins falls to us. Deebo samuel will probably go 2nd round. Here was a random one I did and just copy/pasted the result. Hope the site updates their big board because i regularly am seeing Lawrence and Wilkins available even into round 2 occasionally which is absolutely unrealistic. Even when running these scenarios, i purposefully avoid taking them to simulate what I think are more realistic scenarios. Since no 7th, I just took a kicker. Really like this draft, perhaps my favorite to date. Especially, Grier (right thing to do but I am irritated we need to do it), Walker, Peters, Kicker. Really like Preston, but know Deebo is the better pick. Hey Rob, do you know if the CBA negotiations could help the case for paying Russ at the top of the market so we dont necessarily need to draft a QB? I’m down to get a hedge, but I’d like to keep Russ and focus our draft stock on other areas more. I don’t think the CBA has much impact on anything. We don’t know what the consequences will be of that. This is the exact type of player we should be taking a close look at for the Seahawks. Not a big name, but could have big time production in the NFL. WRs, RBs and DTs all could possibly fall into later rounds and end up being perfect draft gems. The small school guys are hard to project, but if you nail it….. sky is the limit at a bargain basement draft pick cost. 1.) Who do you hope the Seahawk’s first pick will be? 2.) Who do you think the pick will be? For the players in realistic range, I’m really warming up to Montez Sweat, but i doubt he will be available to the Hawks, especially after the inevitable trade down(s), so if I’m looking for someone in the available range, Winovich is my favorite. I’m well aware that he lacks the length the Hawks look for, which makes him unlikely, but i still like him. As for Walker, I can genuinely see him as a multi-purpose Bruce Irvin type who can play LB on 2 downs and rush the passer on 3rd, effectively covering two needs. I just wanted to get a sense of the feeling in the community before the combine because there could be some serious swing in opinion afterward, and it would be interesting to see how sentiments may change afterwards. I want Jachai Polite but I think itll be Charles Omenihu. Since the Hawks first pick is likely to come somewhere in the top half of R2, we have to be realistic in regards to the impact the player will have on the team. Ideally the first pick will be able to get their feet wet in their rookie year, similar to Penny in 2018. Learn the system, the playbook, establish some rapport with teammates and coaches, and so on. Hopefully they also have the ability to become an impact player following a smooth transition to the NFL. Although its not likely to be a high pick after trading down, there’s still an expectation for a second rounder to become a key contributor by year 2/3. Personally, I would love to see the pick be a WR with the potential to 1) provide explosive plays in a “Saints style” screen game, 2) replace Angry Doug in a couple years, and 3) complement T Lockett and be a down field threat as well. Rob, please don’t talk about Preston Williams anymore. Avoid him, forget his name, shun talking about him. I don’t want any publicity on this guy. No one should draw attention to him. John Schneider, just draft this guy. Just do it. Don’t ask questions, don’t trade down, don’t worry. Pete Carroll, your ship has come in. Maybe most of “draft media” hasn’t caught onto him yet, but you can be sure every NFL team knows exactly who he is. As was pointed out above, the Packers just hired his WR coach from CSU too. Anyway, he’s barely hanging by a thread on my board, no earlier than day 3, and that’s only because I have no way of really getting to know him like NFL teams will, so I’m giving him the slightest benefit of the doubt for now. All football, no drama please, just like last year. Go get yourself a Terry McLaurin or a Deebo Samuel instead, or any one of the Georgia WRs. I have a feeling you’ll find yourself thanking me sooner than you think. Fun looking mock draft, Rob. All moves feel plausible. Considering the amount of depth Seattle needs to acquire, dropping that far doesn’t feel too drastic at all. Seattle adds a long rangy linebacker to replace KJ Wright, and defender the perimeters, where they showed the most vulnerability in 2018. Getting more impactful talent in the front seven on rookie deals is key moving forward when looking to extend other veterans (Bobby, Jarran, Frank). Seattle adds QB2 with potential to develop into a legitimate starter down the road. If he lasts this long, they will almost have to jump on him here. Might not get past the Saints in R2. Seattle adds a physical big play potential WR with character concerns. This is an area of the draft where Seattle can afford to swing at the fences on talent. Seattle adds depth to the interior of the OL. Even if they sign Sweezy and Fluker, neither is guaranteed to be long term. Seattle adds depth at LEO. Gustin dealt with a lot of injuries in college but looks to have SPARQ-y talent. If he catches on through camp, he might even be a bit of a edge if Clark is franchised. Seattle finds their outside corner prototype in the classic Pete Carroll mold. Seattle adds a big two gap space eater former five star recruit to add to the rotation. Seattle needs to defend the run better in 2019 period, and it all starts inside. Not drafted TE, OT, Safety, or RB. I like Saunders. Will check out Hanks. If McLaurin, Deebo, Campbell, Brown and Hock went before they pick how likely do you think the Hawks will draft an offensive weapon (WR/TE/RB) with their first pick? Seems likely then they’ll go for a D player even more likely to me. What do you think about Isaiah Johnson? Matty F. Brown talked to him, and he prefers the kickstep. Need to polish technique, but to me, he’s 100% Seahawks CB. What do you think, where would he go? Rd 3? Rd 4? Also what about kickers? Do you think there is a kicker in this year’s draft that can elevate the position as did Dickson to our punting? Don’t normally do mocks myself, but I ran one just for fun. The lack of picks made it a fun challenge to trade down and still get needs filled. Think the computer grossly misreads where some of these guys will fall and likely shouldn’t have been available when I picked them. I’d be happy with a draft like this though. Another WR to consider on day 3 is Gary Jennings of WVU, 6’1″ 213, 33″ arms, 54 catches for 917 yards with 13 TDs in 2018. Kept hearing all week from Tony Pauline and others at the Senior Bowl practices that he looked much better at separation, speed and had better hands than his more acclaimed teammate David Sills. Then came the Senior Bowl, and he looked like he has great speed and separation on his TD catch and the 54 yard bomb from Tyree Jackson, even has to slow down to catch it and switches it to his left hand while Adderley is trying to knock it free. Great mock and trade-down for the Seahawks Rob. Gets it all done in 1 trade to pick up 3 extra picks. Saunders is a player I meant to get too after the senior bowl, thank you for bringing him back up. I watched his game against NDSU (The Alabama of the FCS) today and I was really impressed. Strength at the point of attack, the quickness to close on the ball and such active, violent hands with a beautiful swim move. On one play he knifed through the middle and then shoved the rb trying to pick him up about 5 yards back into the QB. Then on the same drive they stood him up at OLB and he effortlessly beats the LT inside. Just an incredible athlete. Ive only seen that game, the senior bowl and the highlights you linked in the article, but as of right now he’s a player I’d be over the moon about grabbing with the Seahawks first pick. Guys: FOr what it is worth. I just read that Khalen Saunders favorite team IS the Seattle Seahawks. Would love to see this guy in a Seahawk uniform. Really? Where did he say that? It was the (formerly St. Louis) Rams, but now it’s the Kansas City Chiefs. I like the colors. My high school’s colors were red and black. In basketball, it’s the (Oklahoma City) Thunder. Russell Westbrook is unbelievable. Potentially missed the birth of his daughter to be in Mobile. And now I love him even more. We need our own version of Tyreek Hill / Tarik Cohen and then rest all load up on Defense. All set for SB ride! Mississippi State DT Jeffery Simmons – a potential top-10 pick – and Colorado State WR Preston Williams have been informed they won’t be invited to the scouting combine because they don’t meet the criteria under the NFL’s policy about past issues involving violence, sources say. What’s this supposed to do? Thanks for mentioning. I was just about to post this. I wonder how many teams have each of them off their draft boards? Williams more than Simmons? I’m making a kind request. Can we please drop this Preston Williams stuff? Especially when it comes to comparing him with Simmons? They are nothing like similar cases. They’re only joined because of this combine link. You’ve said your piece on it now. I really, really don’t want a repeat of the Da’Rick Rogers stuff from a few years ago (when the Seahawks didn’t touch him and he didn’t get drafted). Rob, I have “kindly” desist from making such further comparisons, realizing that we do differ in that respect. As I do with Zierlein’s & Bugler’s list of some reported off field issues that aren’t really factual. Like being kicked off UT for domestic violence, when the incident occured, after leaving UT voluntarily, during his year of ineligibility. But, that’s what I appreciate about your blog, in allowing others to express opinions that may differ from yours. I do thank you for responding. But ultimately, our opinions really don’t matter they’re just opinions. The ones that really matter are when GMs go home to their significant other, then listening to words like, “honey your have ‘splaining’ to do”. I’m sure you’ve had some explaining to do for spending extended hours on that keyboard, right? So, shouldn’t the woman have a greater voice on such matters of violence against women in the league? I think Rice would be well qualified to be on a hearing committee that resolves such matters. I will not make any comparison of Mr. Williams with others. But, I do advocate giving this young man an opportunity. The Judge ruling his case agreed. I do appreciate the woman’s role in this decision. He has no domestic violence charge against him, just a deferred sentence for harassment. He has learn from this, as this past year has shown. He has moved on from it, as he states on his twitter account. But unfortunately, others have not. BTW, I’m good with it. It just adds more fuel to the fire. So Rob, I agree to disagree, and we’ll just wait to see what happens. Thanks Rob! Both will still have their pro days, both will still be vetted, both are still extremely talented and at or near the top of their respective positions. I don’t get what the NFL thinks it’s trying to do here? In regards to DV, this is where they draw the line in the sand? The combine? Wild. Wow, both of these guys (Saunders and Williams) flashed big time in those highlights. What exactly is the nature of the “character concerns” for Williams? Do we know? A reasonably long list of incidents it seems. I don’t see how the Giants will carry Manning and Carr”s contracts? Plus, the Browns aren’t taking a 2nd day receiver with their 1st round pick. Brown isn’t a second day receiver. If they trade for Carr they cut Eli (and save $17m in the process).